Easy Jolly Rancher Turkey Suckers Recipe | Be Plum Crazy! 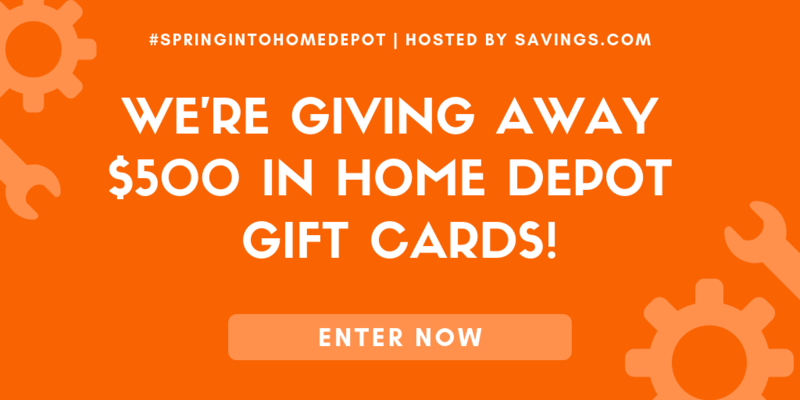 Thanksgiving is about a month away and will be here before you know it. Here is another easy recipe like the Jolly Rancher Frankenstein Sucker recipe we shared a couple weeks ago. 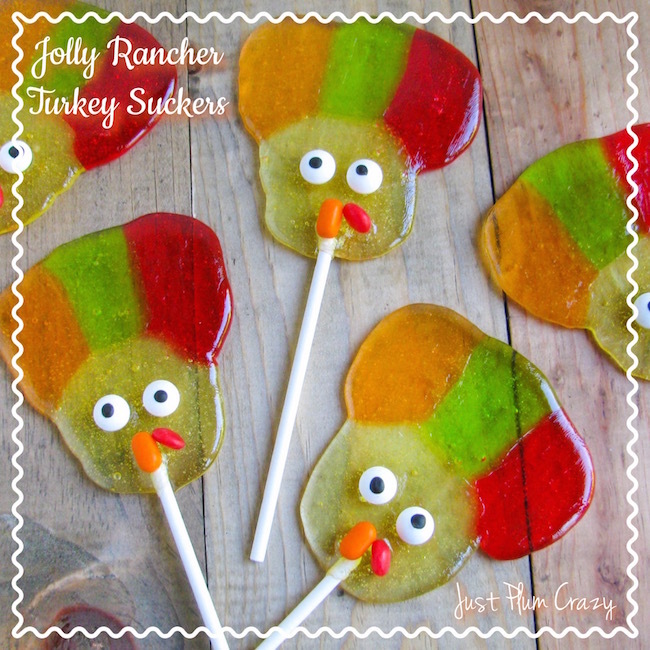 The Easy Jolly Rancher Turkey Suckers recipe is fun for everyone. And the kids will love eating them too. 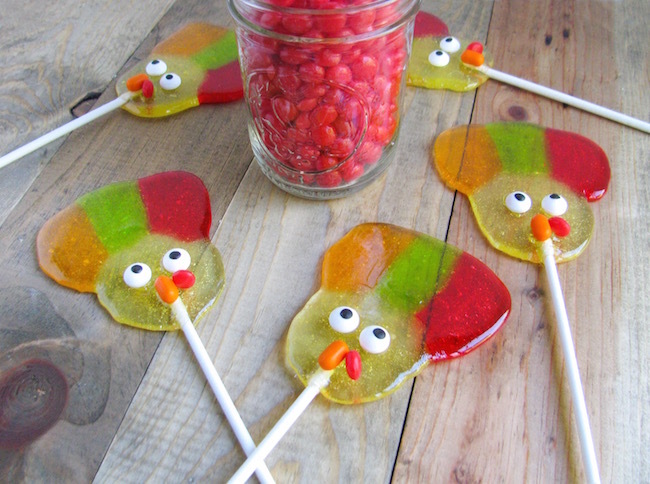 So let’s get started making the jolly rancher turkey suckers. 4. 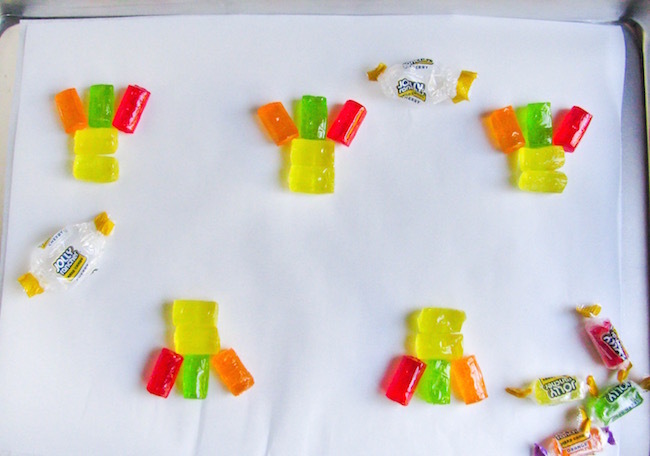 Stick together 2 yellow jolly ranchers vertically, make sure they are touching. 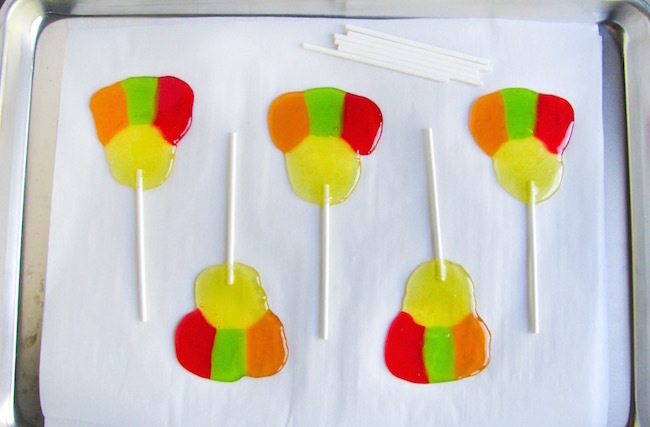 Then take your red, orange and green jolly ranchers and stick them above the yellow ones in a fan motion. Leave enough space so when they come out of the oven you can put a sucker stick in them. 5. Stick in oven for about 5-6 minutes. 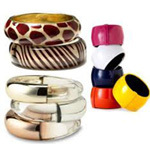 Keep a close eye on them and take them out when you get the melted desire you are wanting. 6. Immediately roll the end of a sucker stick in each sucker towards the bottom. 7. Quickly add the candy eyes, tic-tacs and redhots. If suckers start to harden, don’t worry, get a lighter and stick the flame carefully where you want the candies to go to and hold for a few seconds. It will melt the sucker just enough so you can stick the candies on. 8. Let them set at room temperature until harden, about 10 minutes. 9. Then they are ready to eat! Stick together 2 yellow jolly ranchers vertically, make sure they are touching. 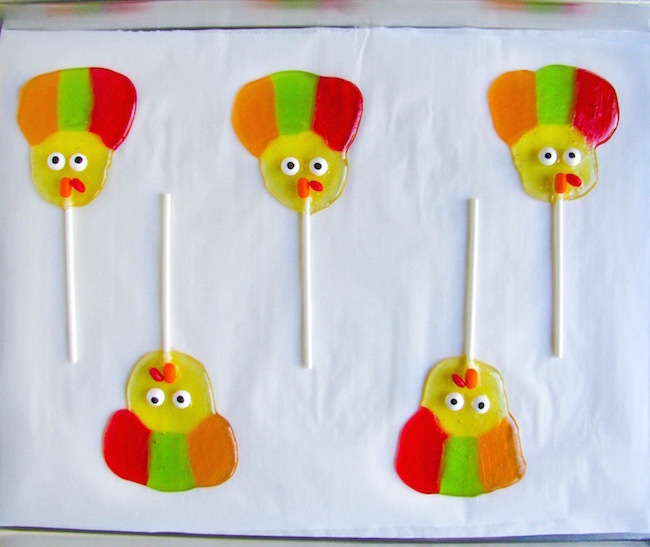 Then take your red, orange and green jolly ranchers and stick them above the yellow ones in a fan motion. Leave enough space so when they come out of the oven you can put a sucker stick in them. Stick in oven for about 5-6 minutes. Keep a close eye on them and take them out when you get the melted desire you are wanting. Immediately roll the end of a sucker stick in each sucker towards the bottom. 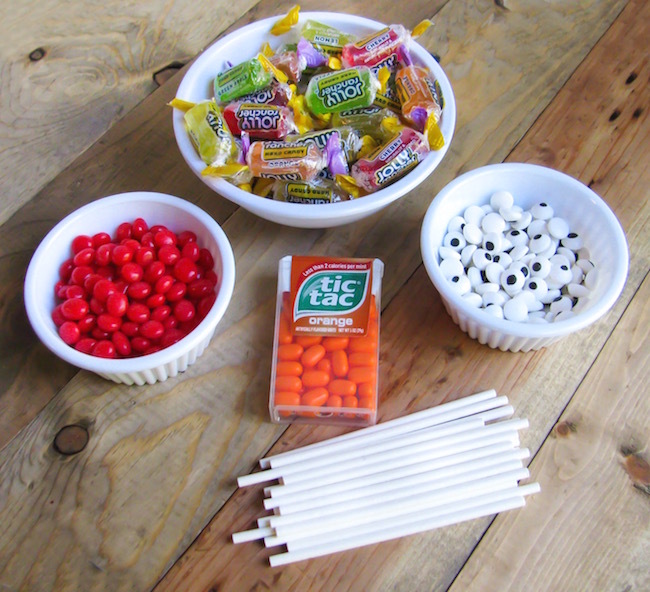 Quickly add the candy eyes, tic-tacs and redhots. 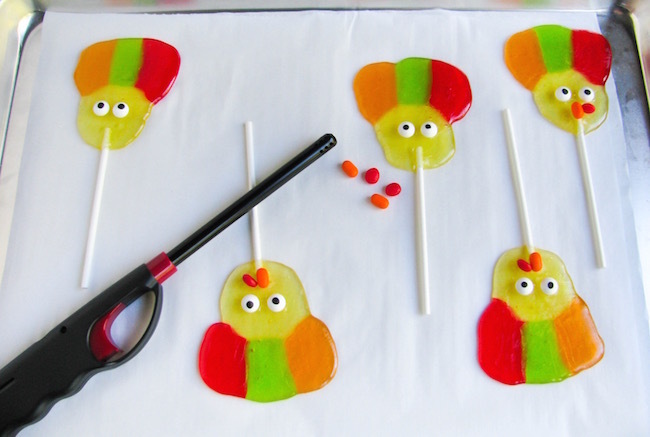 If suckers start to harden, don’t worry, get a lighter and stick the flame carefully where you want the candies to go to and hold for a few seconds. It will melt the sucker just enough so you can stick the candies on. Then they are ready to eat!! Instead of using oven; can I microwave then. 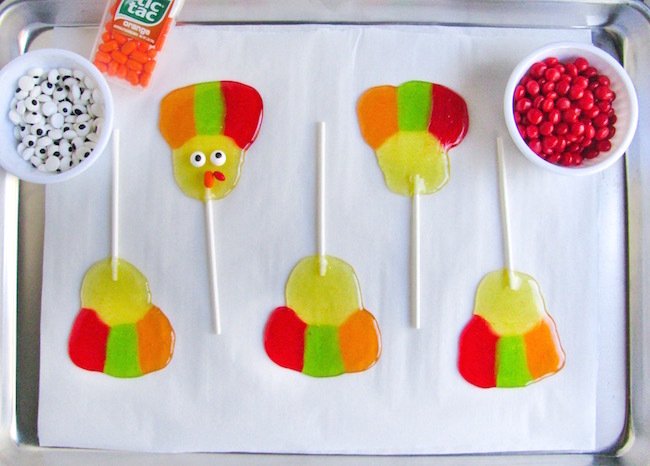 These turkey suckers are SO cute! No way to look at them and not smile. Lucky children.